These figures are printed in a translucent plastic which makes them very hard to see and very hard to photograph, so clearly they must be painted before they can be used. To help you see what these figures actually look like, we have primed a couple of poses, and fully painted another, which you can see below. The role of the US Navy in World War is widely acknowledged, and has been immortalised in numerous films over the following decades. The bulk of USN activity was in the Pacific, which many Americans considered the most important theatre anyway, but it served all over the World, and during the four years from Pearl Harbor its personnel increased from around a third of a million to ten times that number, almost half of whom served afloat. Despite this enormous contribution this is amongst the first sets of figures to depict the USN in this hobby, and the title tells us we can expect men at Action Stations (General Quarters). These figures are produced with a 3-D printer rather than injection moulding, and feature 30 all-different poses. 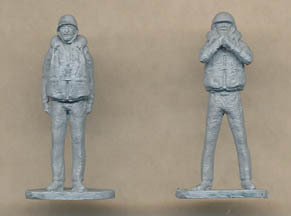 Although the clear plastic makes detail difficult to see, the poses can be made out, and mostly include men with hands raised as if holding or operating something. Often this would be weaponry of some sort - the figures were designed mainly to man AA Guns, from cal .50 Browning, 20 mm. Oerlikon and 40 mm. Bofors Guns - but some could be carrying ammunition or operating some other aspect of the ship. Since no one has anything in their hands it is up to the customer what purpose they are put to, but we thought all the poses were very useful and appropriate. The first two figures in the second row are leaning back with very straight legs and clearly holding a trigger, so are perfect for anti-aircraft gunnery, while five of the figures in the last row are seated, again making them ideal gunners. There are no poses of men running etc., but a few that could pass as more relaxed men, suitable either for combat or for populating a ship in quieter times. As men operating the guns or other aspects of the ship we can have no complaints about the poses here. The men are remarkably consistent in their style of dress. All wear a helmet, chambray shirt, dungaree (blue jean) trousers and a lifejacket. The helmet is the M1 model, seen from 1942 for the duration of the War, apart from two who wear the larger Mark 2 'Talker' helmet which accommodated headphones. All the lifejackets are of the same type (several models were used during the period), with a well-stuffed collar and filling both front and back. 'Talkers' sometimes had cut-down versions but everyone here has the same. While many other orders of dress could have been represented, everything here is accurate. Fine detail is not so crucial on these men, who basically wear a practical working dress devoid of decoration or other finery, but the sculpting is first class with perfect proportions and highly realistic poses not possible with conventional steel moulds. This is hard to see thanks to the clear plastic, but hopefully our primed and painted examples give some idea of their quality. We found them a joy to paint, with surface features of just the right depth, neither exaggerated nor undetectable. The clothing even has a slightly rough feel to it, while the helmets are perfectly smooth, and of course there is zero flash or excess plastic - one of the advantages of this method of production. While these figures might well grace many a model ship, and so be glued to the spot, more general modellers will have to find bases for them, as did we, though we found they glued very well to normal hard plastic. Essentially, this is a cracking set that delivers lots of well-done poses and with perfect historical accuracy. Since this company makes a growing range of sets for the USN in World War II, the lack of variety in clothing here is more than compensated for by these other sets, so while the nature of their duties means they are not the most dynamic figures ever made, we still felt this was a superb set depicting a long-overlooked subject very well.